On Tuesday, Home Depot posted its highest revenue for a quarter in the history of the business, with sales at same stores also beating expectations on Wall Street. While a number of retailers continue to struggle to increase sales, Home Depot has been using the home improvement trend as consumers continue spending money to upgrade their homes. Looking forward, the home improvement retailer based in Atlanta raised its forecast for its complete 2017 fiscal year for the second time, as it now expects its comparable sales to grow by over 5%. Stock at Home Depot was flat after the announcement during premarket trading. Earnings at Home Depot reached $2.25 per share compared to a profit forecast per share of $2.22. Revenue reached $28.11 billion while Wall Street was expecting $27.83 billion. Revenue was up over 6.2% compared to the same period one year ago. Sales at same stores were up 6.3% better than the 4.9% expected growth. Net income at Home Depot for its second quarter reached $2.7 billion equal to $2.25 a share, compared to last year during the same quarter of $2.4 billion and $1.97 per share. CEO of Home Depot Craig Menear said that the latest results came thanks to the hard work of the company’s associates and the outstanding values that were brought forth by supplier partners. Sales at stores that were open for 13 months or more were up by 6.3% while U.S. comparable sales were up 6.6% said officials with the home improvement chain. Home Depot has benefitted from both the growth in big-ticket item sales, which includes products over $900, and through an increase in the average ticket per shopper. During the just ended second quarter, Home Depot shopper’s receipts on average rose by 3.6%, the customer transactions count grew 2.8%, and the sales per square foot at Home Depot were up 5.9% from the same period one year ago. 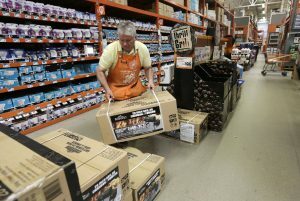 This year, spring was somewhat elongated said Home Depot officials, which is likely what helped to boost the results during the second quarter for Home Depot. More importantly, Americans are continuing to spend money on home improvement projects. During June, more contracts were signed by Americans to purchase homes, while sales in the U.S. of new homes increased slightly. During May, home prices in the U.S. reached new highs for the sixth straight month. Home Depot is now expecting its full year revenue to increase by 5.3% and for its comparable sales to move up by 5.5%.